Our first full day in Colombia (and our FOUR YEAR anniversary!) 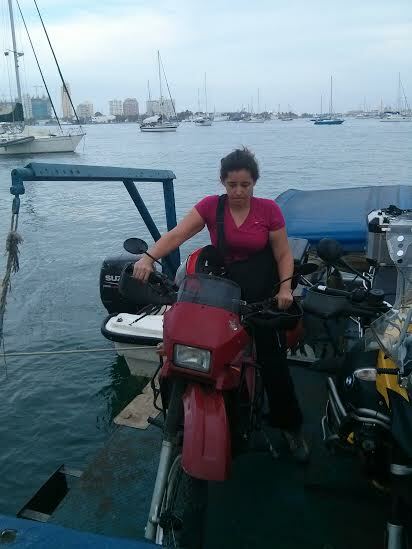 was spent running all over Cartagena trying to legally enter the country with our motorcycles. Six o’clock came early, and Alex rolled over in her bed and gave her cheeriest “Good Morning Jesse!”, as he we sleeping in the bunk underneath me. He didn’t loose a step and replied back with his patented “Hey Buddy!”, as we all got up and got ready to get the bikes off the boat. A twenty minute walk landed us back on the Cartagena docks just as Captain Ludwig and crew were pulling off in their dingy. All safely back on board the Stahlratte, we loaded panniers and collected our gear, getting ready for the “floating dock” that was going to carry us to land. A little waiting around, and then all the sudden bikes were flying through the air and we were all magically on a piece of floating metal, one tip over and Alex would have been in the ocean as Ken’s massive GS1200 was right next to her. All disasters avoided, we got the bikes on land, and Nico realized he had forgotten his keys back at the hostel. 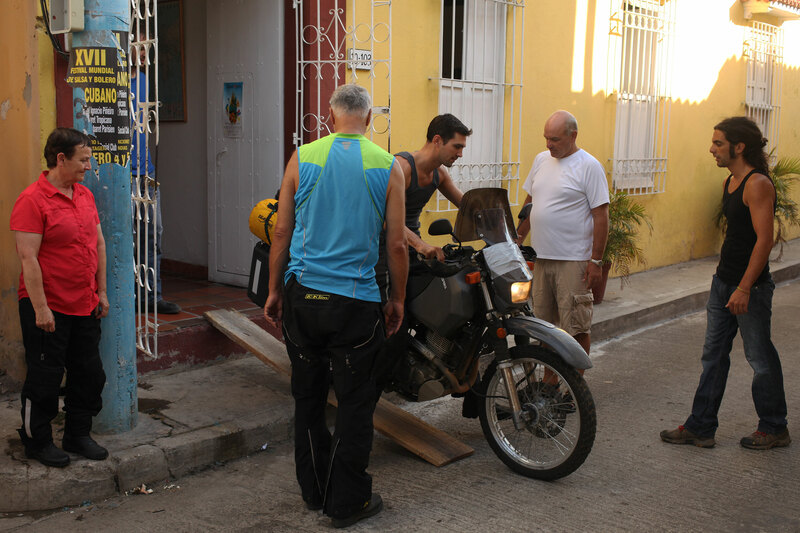 No big deal, Ken borrowed a rope from the crew, tied it around the GS1200 and off we went to Aduana (customs), no passports, no insurances, not legally in the country, just seven bikes, one being towed. To condense the next seven hours, the fixer that the boat hired to help us through costumes was late, so we went back and forth from the hostel and didn’t get to leave Aduana until 12:30 (supposedly when lunch was happening), this confirmed to Alex and I that we can do the boarders just fine on our own. A quick stop back at the docks to get the rest of our panniers and gear and then off to buy insurance. It was a full day of bureaucracy (and here we thought it was going to be easy). Finally done with our list of chores, we headed back to the hostel through the gritty grueling Cartagena traffic. Ken and Diana ride two up on a GS1200, and with all the gear they are as big as some of the taxis we have seen. A taxi kept trying to edge into Ken’s lane and and Ken finally showed him what he thought about that by landing his size 13 boot into the cabs door. Jesse and I looked on thinking that we might have a brawl on our hands in the middle of the street, our ragtag ‘biker gang’ versus the taxis of Cartagena. Luckily it didn’t come to that and we all got back to the hostel without harm, no worse for the wear. Our last day in Cartagena we all went on a walking tour of the city, before Jesse and I split off to do some motorcycle supply shopping. The rest of the day was filled with bike maintenance, chain cleaning, and laughs, with a little bitter sweet realization that we would be parting ways soon. A fellow traveler had shown the group a picture of a BLT earlier in the day, and Alex spearheaded our last meal together. We had a BLT party, real comfort food for a group of weary road warriors. The next day saw bags packed, bikes loaded, and handshakes all around. We all had to get out of Cartagena, so five bikes, minus Nico, rode through the packed streets desperately trying to escape the city before the heat got out of control and the traffic started. Accomplishing neither of these goals, we finally got out one very long hour later. After escaping the city limits of Cartagena we stopped at a roadside restaurant for one last meal together before the 5 remaining bikes split into two. Ken, Diana, and Taylor were off to Medellín, but Jesse mentioned he was up for taking the alternate route with us to Bucaramanga (an Instagram follower mentioned that the roads around Bucaramanga have some of the best scenery in Colombia, but more on that later) and we soon split off, Jesse leading the way as he has GPS. Two long days of riding followed, as our trio headed to Bucaramanga. The landscape was unimpressive compared to what we have ridden through in the past, and some close calls with gas (literally drove through a town where all the gas is sold by people from gallon jugs) were the mainstays of the riding. The one noteworthy part of the ride was that Alex and I have now earned our truck passing badges, as we passed at least a hundred trucks on our way to the city. To us it is just another day on the road. We finally made it to Bucaramanga just as the last rays of light crested the mountains and found a safe place for the bikes and ourselves. Exhausted from days ride, we grabbed a quick bite and then headed to bed (Alex and I without showers- oh our poor dorm mates). The next day Alex and I were headed for San Gil and Jesse was rolling out to a hostel owned by some friends he met in Medellín. We shook hands with our final travel companion and watched him take off on his DR650. In a lot of ways this has been a trip of goodbyes just as much as of beginnings. We have had to say goodbye to family, friends, places, hostels, always on road to new beginnings. I know it is cheesy, but I don’t care, there is a lyric from the song ‘Closing Time’ by Semisonic “every new beginning comes from some other beginning’s end” and I thought about that when Alex and I hit the road, AutopistaEnd once again. 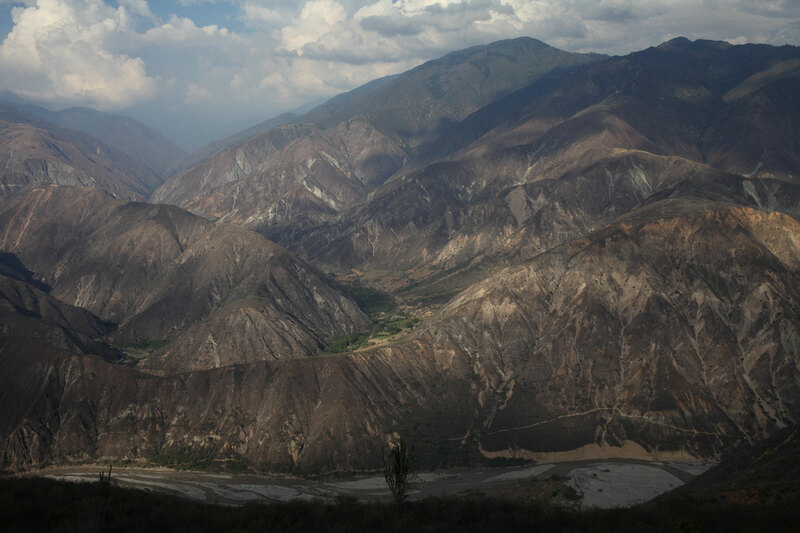 Not knowing what to expect heading to San Gil, and only knowing it by suggestion, we headed into a deep valley. Expecting to see trees and foliage we were shocked when the landscape turned arid, spotted with cactus that reminded us of Mexico. Then we were suddenly in the middle of what I can only describe as the Grand Canyon of Colombia. We climbed and climbed, zigzagging through the canyon, trying to avoid the trucks as we took in the picturesque scenery. Alex and I both agree that it ended up being one of the top five rides of the trip thus far, so we are very thankful for the suggestion that came from our instagram follower! Now in San Gil, recharging the batteries and getting ready for more adventures and friends to come. To everyone we have meet along the way, we are richer for it.